Well, the October 2012 24-hour read-a-thon has officially come to an end. Which hour was most daunting for you? Hour 17, the hour in which I fell asleep! Could you list a few high-interest books that you think could keep a Reader engaged for next year? The Westing Game was great because it was an engaging mystery but also a short children’s book. For read-a-thons, short is good. 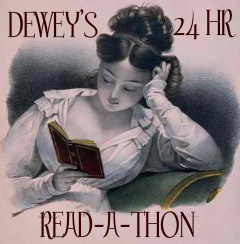 Do you have any suggestions for how to improve the Read-a-thon next year? Not really; I think it went pretty well! What do you think worked really well in this year’s Read-a-thon? I appreciated that the posts for each hour kept track of all the ongoing challenges and challenge winners. It’s great to have everything centrally located like that! How many books did you read? Three, plus a little bit of a fourth. What were the names of the books you read? The Assassin’s Curse by Cassandra Rose Clarke, The Westing Game by Ellen Raskin, My One and Only by Kristan Higgins, and a little bit of The Raven Boys by Maggie Stiefvater. Which book did you enjoy most? Honestly, all of them! Which did you enjoy least? N/A. If you were a Cheerleader, do you have any advice for next year’s Cheerleaders? I wasn’t a cheerleader. How likely are you to participate in the Read-a-thon again? What role would you be likely to take next time? Oh, I’ll definitely be back for more read-a-thons! I’ll be a reader, and I’d like to host a mini-challenge at some point. Sure, my progress wasn’t super amazing — only 3 books (and less than 900 pages) read. But I had fun, and I got to read all day long, so I’m not complaining! Congratulations to all who participated, especially those who made it through all 24 hours! And thanks to everyone who stopped by — I really appreciate it! I think 900 pages is great! Thanks! I guess it’s all relative. I felt like I kept getting distracted during the read-a-thon, which slowed me down a bit. You did awesome! 3 books is better than none! Three books and almost 900 pages is pretty impressive! I didn’t do nearly as well myself, but I had fun and got to check out lots of other blogs, so it was a successful day. Well, having fun is definitely the point! Glad you enjoyed your read-a-thon! You had a great run! I finished 5 books but they were all so short, only amounted to 600+ pages, your reading 800+ pages was amazing! Thanks! It’s smart to pick short books, though — easier to stay focused!